Avengers: Infinity War is oh-so-nearly here and, so far, Marvel has done a pretty good job of keeping the major moments under wraps. Until now. 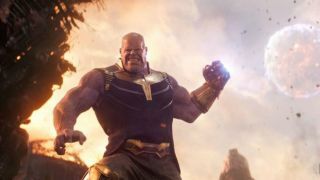 Entertainment Weekly has pulled back the curtain on Marvel’s endgame – and what’s behind it will entertain, infuriate, and have you worried about the fate of more than one of Earth’s Mightiest Heroes… It goes without saying, some spoilers may follow. EW has managed to get the deets on a few big goings-on on Earth (and beyond) for the third Avengers movie. Let’s run through the best bits. Uhh, do I actually need to say more than this? Thanos plucks a freakin’ moon out of the sky and tosses it onto the ground. If Tony Stark is in the vicinity then he may not be long for this world (or any other, for that matter). Even Iron Man can’t fight a moon. I think. A Big Bad is only as good as his motivation. Thankfully, Thanos has a doozy of one: he wants to kill half the universe. Not for no good reason, however. After Thor: Ragnarok, Mjolnir has crumbled into a million pieces. His replacement sounds just as good, though. He’s going to be wielding Stormbringer (of course that’s its name), a mystical axe. All roads lead to Wakanda. Vision is stationed there, weary and not in the best of health, and nearly every Avenger is there to make sure Thanos doesn’t get his purple mitts on another Infinity Stone. There’s Thor, Cap, Black Panther, Hulk, Black Widow, Rocket, Groot, Bucky, and Falcon. Expect that all-star team up to form the crux of the movie’s final act. Bucky and Rocket bantering? Okie doke, this is the best movie ever. There’s a moment we can’t wait to see on-screen that involves the trash panda trying to barter for Bucky’s right arm. “Not for sale” is the stern reply. Say hello to the White Wolf. If you’ve seen the Black Panther post-credits (and read 6 questions I had after watching Black Panther) you’ll know why that name is so important. For now, though, it’s merely cosmetic, but, as you can see, Infinity War is already setting the scene for several earth-shattering (and moon-shattering) changes headed to the MCU. Be afraid. Be very afraid. As we close in on Infinity War, you might have some catching up to do. If so, join us for our great big MCU recap every Sunday!